The UK Radio Streamer for Mobile is an experimental, web-based application that enables you to listen to a wide range of British radio stations on any mobile phone that support Flash Player 9 or above, including almost all Android and Maemo devices; radio stations include Absolute, Capital, Heart, Kiss and Magic to name but a few. 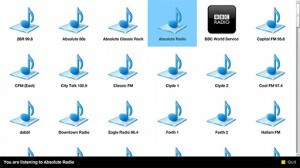 To start listening, point your mobile browser at http://bit.ly/ukradio, which will take you to http://labs.mesmotronic.com/ukradioplayer/mobile/. Until Flash Player 10.1 is finally released in the wild, touch functionality is fairly limited, so you’ll need to use your mobile’s arrow buttons to scroll for now. 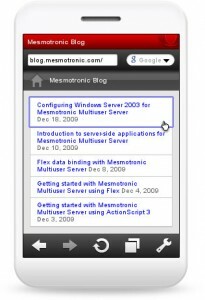 You can now access the Mesmotronic Blog on your mobile. It’s the same URL, the same great content, just formatted for small screens.